*Looks like Lamar Odom‘s life is in total disarray at this point. The latest, according to TMZ, is that simply up and vanished and folks associated with him are extremely concerned. They are scared that he’s off on a drug binge. At this point, folks on both the Odom and Kardashian sides of the families, haven’t had contact with him in over a week or more. They are especially concerned about him doing crack cocaine. As TMZ first reported … Khloe Kardashian threw him out of the house Wednesday after attempting an intervention which Lamar squarely rejected. We’ve already told you Lamar’s been battling addiction for at least 2 years — and even reluctantly agreed to go to rehab in San Diego a year ago … although he bailed after 3 weeks. 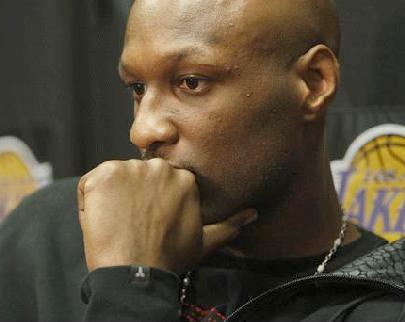 TMZ‘s sources say Lamar Odom has started losing it since basketball season ended and he became a free agent. Those sources say his drug addiction is the core reason why his marriage to Khloe has fallen apart. Lamar find you a good SISTAH! and you will be ALright,, someone who understands your struggle,, you will be alright. I think Lamar is just tired of the circus and wants out. I doubt he is on crack. Maybe he is in hiding to get a break from the craziness. Kanye…this is a warning. You’re next!!! I PRAY THAT LAMAR ODOM IS OK HIS FATHER SUFFERS FROM DRUG ADDICTIONS AND THAT’S PROBABLY WHERE HE’S HIDING OUT WITH HIS FATHER SINCE L.A LAKERS TRADED LAMAR HE’S SEEM TO BE VERY STRESSED AND DEPRESSED. DAMN CRACK, CRACK ADDICTS SOMETIMES BECOME VERY VIOLENT WITH MEMBERS FROM THEIR FAMILY HE’S HURTING I HOPE HE GETS THE HELP HE NEEDS AND SOON. First, my prayers are with you Lamar, if indeed you are on a binge. Second, how do we know he is actually missing or on a binge? Who put this story out there? Just asking cause we know that the Kardashians are scandalous. JMO. Again, my prayers are with Lamar because crack is no joke. Hopefully he has someone cares enough to help him. Don’t know how true this story is but Lamar is a grown man and knew of the consequences of getting ‘caught’ with this trashy family. He should’ve stayed with the mother of his kids. How long has he been on crack? I’ve never heard about him being on drugs before. People just don’t start doing crack one day. This story could’ve been planted by Khloe. Everything started downhll once he hooked up and married a Kartrashian within a few months of contact in a bar. Never heard he was having problems with the Lakers until they took over his life and quickly began dictating all the terms. If he’s on drugs it’s because he now has the chance to reflect on how he allowed those folks devour him and spit out the bones. I really hope he doesn’t do anything that will land him in jail at this point. @Melody: That’s why I stated that he should’ve stayed with the mother of his kids. He basically abandoned her and the children to be a ‘star’. I think that’s the main reason he hooked up with these trashy people. He probably felt that connecting with these people would bring more fame and money to his basketball career. Now look at the fallout. @ Melody, I agree with you hopefully, Lamar will come to his senses and see this family for what they are opportunists. I think his marriage to Khloe and all of the media scrutiny has gotten to him, thsi family thrives on the limelight and it has become too much now. I hope he is okay. @Melody… I tend to agree with you. He was not used to this type of attention. He dropped the kid’s mother like yesterday news and moved on to Khloe. Now all of this bad press? I kind of liked the two of them together! This may have been a publicity stint planted by Khloe since everybody except her knew he was probably cheating and they were actually separated so to save face, he’s on crack, did a stint in rehab…if he was a crackhead, you can best believe this would have never been a known secret. Everybody but her knew this would end just like it started and Khloe is more embarrassed than anything that the media found out he was oinking someone else and he probably filed for or will file for a divorce and knowing she doesn’t have a job, Kris is his manager, he’s DONE!!! No matter what the Kardashian girls do… no matter how slutty… no matter about what they do… Kris Jenner to the rescue. Their machine will spin the bad behavior and make it look like it is good for MOST women! This sounds like they have thrown Lamar under the bus for cheating! No Kris Jenner (his manager) to the rescue! I guess he should have read the fine print! You folks need to stop. Lamar started acting strange every since the Lakers trded him.